At the Drouot auction centre in June around 3000 items of Asian art went under the hammer in a series of 20 auctions that were either dedicated sales or featured substantial Asian sections. A huge 4ft 8in x 9ft 10in (1.36 x 3m) painting on silk from the Guangxu period (1875-1908) generated an equally sizeable amount of interest in a June 26 sale held by Tessier & Sarrou (25% buyer’s premium inc VAT). 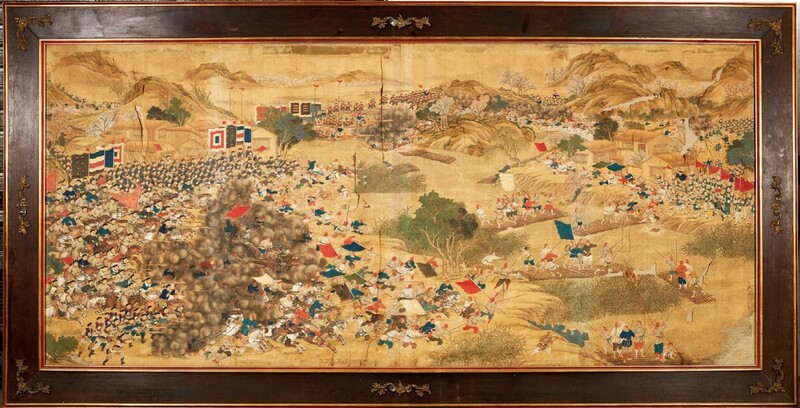 It depicted a dramatic battle scene from the Qing dynasty in which the imperial army was victorious over the Nian rebels, an anti-Manchu revolutionary movement in northern China. The painting is part of a group of 67 works that were an imperial commission depicting military victories. It is based on a geographic map and shows an assemblage of various incidents rather than one particular moment – the selection decided by a court and ministerial committee. Certain high-profile participants are indicated by their names, which are inscribed in a rectangular panel. The €30,000-50,000 estimate put on this piece proved wide of the mark when the hammer finally fell at €650,000 (£575,220). Another particularly popular lot came up in a sale held by Auction Art Remy le Fur (25% buyer’s premium inc VAT) on June 22. Ten phone bidders and several more in the room contested a 3ft 1in x 4ft 5in (94cm x 1.35m) panel described as a door ornament. 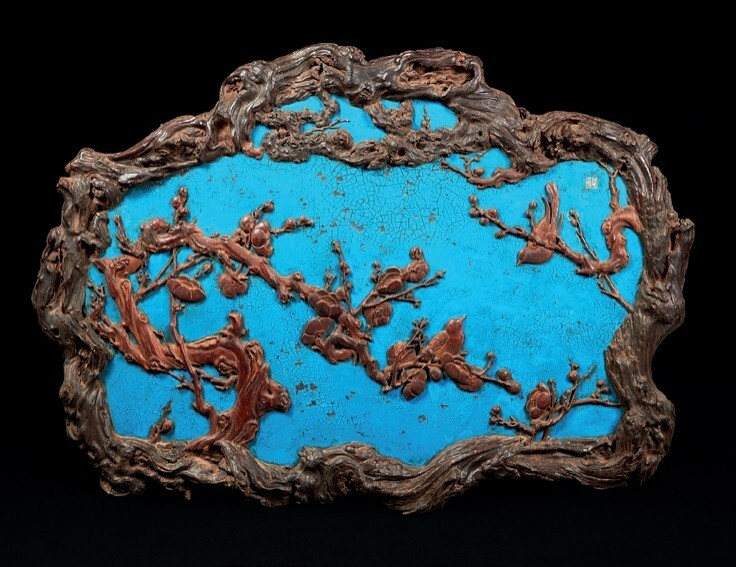 Dated to the 18th century, it was made from blue lacquered-wood framed with rootwood and carved with two birds perched on branches of plum blossom. This unusual and sizeable piece was the object of a bidding battle lasting 20 minutes and was finally hammered down for €620,000 (£548,870), leaving its €10,000-15,000 guide far behind. 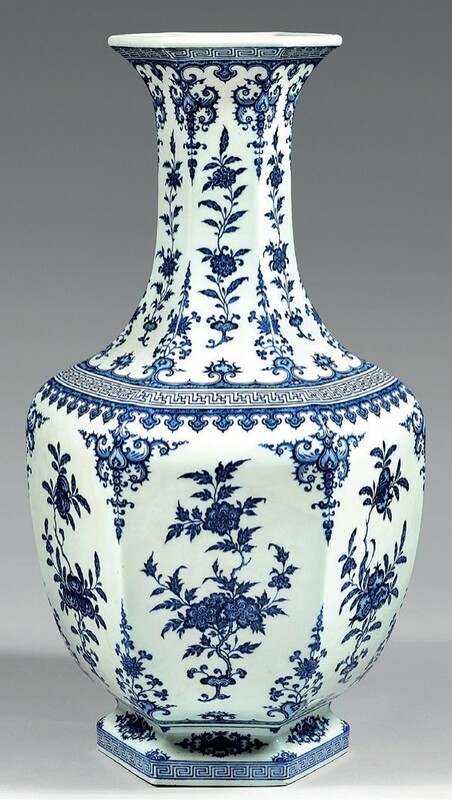 A classic Qianlong blue and white vase provided Drouot’s top porcelain price of the series in a sale held by Jean Marc Delvaux (25.2% buyer’s premium inc VAT) on June 22. Standing a substantial 2ft 2in (67cm) high, of baluster shape vase and hexagonal section, it had a six-character Qianlong mark to the underside and was decorated with two registers of flowering shrubs including peach, chrysanthemum and lotus divided by a Greek key border. It outstripped its €300,000-400,000 guide to take €850,000 (£752,210). 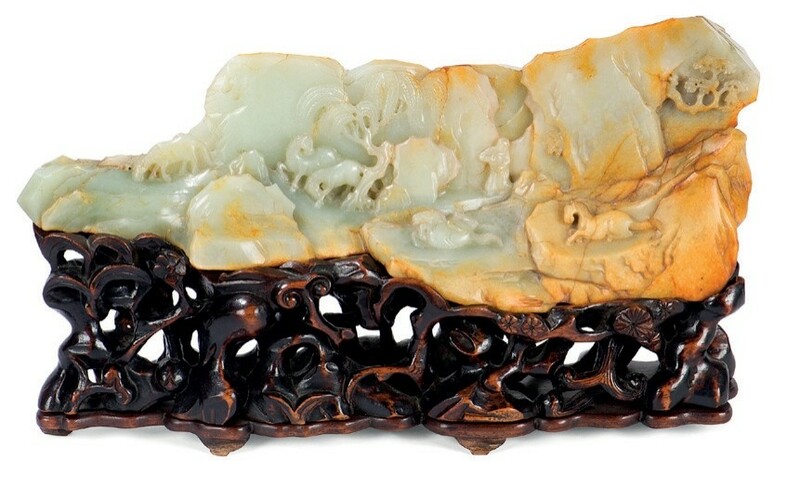 Jade carvings are perennial best-sellers in these auctions with, as already noted, strong demand from Asia. As well as Sotheby’s collection there was a keenly contested example at Joron-Derem’s (23/21/20% buyer’s premium inc VAT) sale at Drouot on June 23. The Qianlong period carving, in celadon stone veined with rust red, was carved to both sides with a scene of horses and their groom in a mountainous landscape surrounded by pine and willow with a small pavilion nearby flanked by a waterfall. It sold for a multi-estimate €225,000 (£199,115).